Things to do at St. Luke’s and Upcoming Events! Join us for Sunday Worship at 9:15 a.m. Then stay for treats, coffee, and fellowship. All are welcome! Help us feed others at our Community Meal. We have a monthly Community Meal on the third Sunday of each month at 5:00 p.m. in Will Hall. We also help with the Catholic Worker House Community Meal on the third Monday of each month at 5:30 p.m. Come for dinner or stay to help community members. 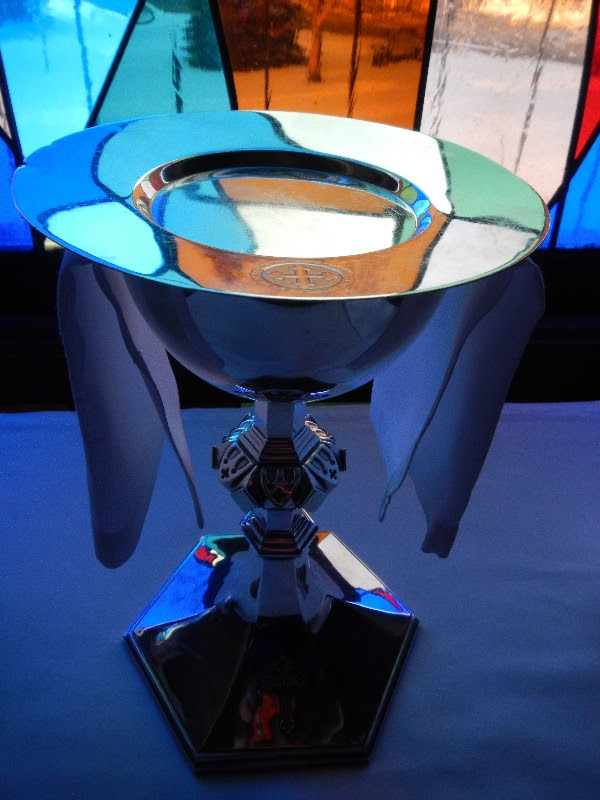 Lectionary Lunch – Have lunch with us every Tuesday afternoon at 11:45 a.m. in Will Hall. We will discuss readings from the Bible and their significance in our daily life. The Cedar Valley Hunger CROP Walk raised $695 for Hunger Relief through Church World Services and the Northeast Iowa Food Bank. Thank you for helping our community. Currently the House of Hope is having a Building Hope Capital Campaign to move to a bigger site. Construction has started and they are utilizing volunteers as much as possible. There is a poster board located in Will Hall where you can buy supplies and donate to help mothers and create futures. For more information about the House of Hope go to: https://www.houseofhopeccd.org/about-us. We are getting ready to host another FAMOUS LASAGNA DINNER! For decades this has been a wonderful evening of great food and warm fellowship. But, did you know that the proceeds from the dinner go to buy dinner for someone else? Over the last few years, St. Luke’s has donated over $16,000 to the Northeast Iowa Food Bank as a result of the dinner. Help make this our best year yet! You can help by selling tickets, making lasagna, and working the night of the dinner. Sign up sheets are in Will Hall. Please speak to Ernie Doeden if you have questions. Please see the new calendar in the Narthex and consider giving Altar Flowers in memory or thanksgiving of loved ones. February 4: Acolytes: Norah Tresemer (C), Owen Tresemer (S), Ushers: Kathy Rasmussen, Irv Rasmussen, Greeter: Sandy McDonald, Lector: Greg Hankins, Chalice Bearers: Kel Schuchart, Dave Buck, Oblation Bearers: Julie Lowell-Lees, Jay Lees, Healing Prayer: Patty Achey-Cutts, Offering Stewards: Jim Schotter, Steve Daniels. February 11: Acolytes: Norah Tresemer (C), Steve Daniels (S), Ushers: Dorothy McCarville, Barb Wagner, Greeter: Chris Opsal, Lector: Jen Dise Chalice Bearers: Megann Tresemer, Patty Achey-Cutts, Oblation Bearers: Bill Blake, Nancy Blake, Healing Prayer: Trish Norton Offering Stewards: Steve Daniels, John Nocero. Altar Guild: Mary Lyman (Captain), Marlene Behn, Julie Davies, Trish Norton, Jen Rasmussen, Margie Smith, Nancy Blake (Linens). Copyright © 2015* *St. Luke’s Episcopal Church, All rights reserved. Christmas Eve Early Service will be at 10:00 a.m. A Family Eucharist will feature the youth of the parish offering the Liturgy of the Word. We have violinists, pianists, readers, angels, shepherds, and even a tuba player! St. Luke’s choir will sing as well. It’s going to be a glorious celebration! Please join us! Christmas Eve Late Service will be at 5:00 p.m. A Traditional Eucharist celebration with special music. Please join us! Christmas Day Service will be at 10:30 a.m. at Thalman Square, Western Home Communities (5500 S. Main Street, Cedar Falls). Songs have long been a way to express joy, offer praise, express grief, and even speak resistance. As we continue to sing our way through Advent, what songs are you singing? Leave a post here to let us know the tune that’s tumbing around in your heart these days. If you’re able, join us for conversation (and maybe some singing!) at Tuesday’s Lectionary at Lunch. There’s always room at the table! Pantry bags are all packed for Sunday’s Free Community Meal. If you’re hungry, we will feed you. If you are thirsty, we will give you a drink. If you’re hurting, we will provide comfort. If you’re are lonely, we will be your friend. The Catholic Worker House in Waterloo does amazing ministry. They provide a safe place to stay and food for the hungry. St. Luke’s is honored to partner with them by providing & serving a hot meal on the third Monday of every month. — at Catholic Worker House. It was a night like any other for those shepherds minding their flock. Some would have been chosen for the night watch, keeping their eyes and ears alert to any potential threat to the herd – bandits and wild animals were among the many dangers. The others would have been searching for a comfortable spot to sleep and stay warm. In those days, shepherds held little in common with the cute kids we usually see on Christmas Eve – the ones wearing bathrobes and draping towels on their heads and waving to loved ones from the chancel steps. Shepherding was hard and dirty work; it was lonely and often ostracizing. So, when the angel appears to them with a message that the Messiah has come it must have been a little perplexing to this group of outcasts. What should they do? Oddly enough, they wasted no time in going to “see this thing that had taken place.” And, once they saw the Christ Child, they went with haste to let others know what had been told to them. “Haste” isn’t a word that’s used much in everyday conversation. It means “speedy,” “rush,” “acceleration,” and “quickness.” Most of us have been moving with great haste this month (or perhaps longer), trying frantically to get ready for family and gift giving and holiday feasts for the Christmas season. While those are all good things for sure, how is operating in haste working for you? Would you like a few moments to ponder some treasured stories? Would you cherish some time to wonder and praise and savor the gift of Christ’s birth? Join us Tuesday at 11:45 AM. There’s room for you at this inn. The gift of your presence is requested! For decades this has been a wonderful evening of great food and warm fellowship. But, did you know that the proceeds from the dinner go to buy dinner for someone else? Over the last few years, St. Luke’s has donated over $16,000 to the Northeast Iowa Food Bank as a result of the dinner. Help make this our best year yet! You can help by selling tickets, making lasagna, working the night of the dinner. Sign up sheets are in Will Hall. Please speak to Ernie Doeden if you have questions. Friday, October 20th from 5:00 p.m. to 8:30 p.m. in Will Hall. All are invited!! Our website is undergoing a slow transformation as we add new features and information. Come back and check us out – often! The story of Jesus’ triumphant entrance into Jerusalem is recorded in all four Gospels. The first service of Holy Week finds us waving our palm branches and singing “Hosanna!” much like the crowd that gathered that day so long ago. But our rejoicing will fade quickly, again like the crowd’s, into somber contemplation of what lies ahead. This Agapé (“love-feast”) recalls the meal Jesus and his disciples shared in the upper room. Join us for a simple meal of Mediterranean fare before the Maundy Thursday service. Throughout the night we will hold a vigil in the church. Join fellow pilgrims as we watch with Christ in the Garden before His trial and execution. Judas left during the Last Supper, but Jesus and the other disciples went to Geth-semane, where Jesus prayed – and the disciples kept falling asleep. Can you stay awake for just one hour for Christ? At this traditional liturgy, the Church remembers the Crucifixion of Jesus Christ. What first strikes our senses is the unfamiliar barrenness of the worship space. There is nothing to distract our attention from the Cross and the saving events we commemorate. We hear the Passion narrative and contemplate Jesus’ deep redemptive love. Tenebrae is Latin for “darkness” or “shadows.” Coming from the monastic tradition, the Tenebrae liturgy uses Scripture to recall the betrayal, abandonment, and agony of the Passion of Christ. It is a deeply moving service with solemn hymns, readings and responses. The church gradually darkens as candles are extinguished after each reading. Our annual “let’s get ready for Lent” pancake supper…It’s fun for the whole family! All proceeds go to support the J2A June Mission Trip! Every third Sunday, St. Luke’s Episcopal Church serves dinner to anyone who is hungry or alone for whatever reason. Co-chairs Diane Lyman and Sharon Kelleher organize about 30 volunteers to cook, decorate and set tables, greet guests, package bags of staple items, bake desserts, and wash dishes. “The meals, which began a little over two years ago, started because we knew that there was hunger in the community. We also knew that people needed companionship,” says Lyman. She was inspired by a sermon at church to become involved. “I just felt challenged to get out there and serve others. This is a way to use one of my gifts, hospitality, cooking and entertaining guests.” Other volunteers feel the same way. Dinner guests come from all over Waterloo, Cedar Falls, and surrounding communities. We serve families with children, all the way up to seniors,” Lyman says. “And we get singles who come regularly.” Relationships have developed; regular diners coordinate transportation to the meals among themselves and look out for each other. In addition, a number of guests are on the parish prayer list. Guests are greeted at the door and asked to find a table at which they would like to dine. The night’s menu is explained and each diner’s meal is brought to him or her rather than asking people to go through a serving line. Dinner is always served on porcelain dinner plates with real utensils, in an effort to make the meal more home-like and to keep with the church’s ecological efforts. Most of the food served and that goes into the take-home pantry bags is purchased through the Northeast Iowa Food Bank, of which St. Luke’s is a partnering member. Some vegetables come from the church’s expanding community garden. In addition to serving dinner at the church, St. Luke’s hosts a meal at the Catholic Worker House in Waterloo on the third Monday of each month. “We cook once and serve twice,” says Sue Fread, coordinator of CWH ministry at St. Luke’s. Special thanks to Bill Witt for many of these photos! St. Luke’s Famous Lasagna Dinner! 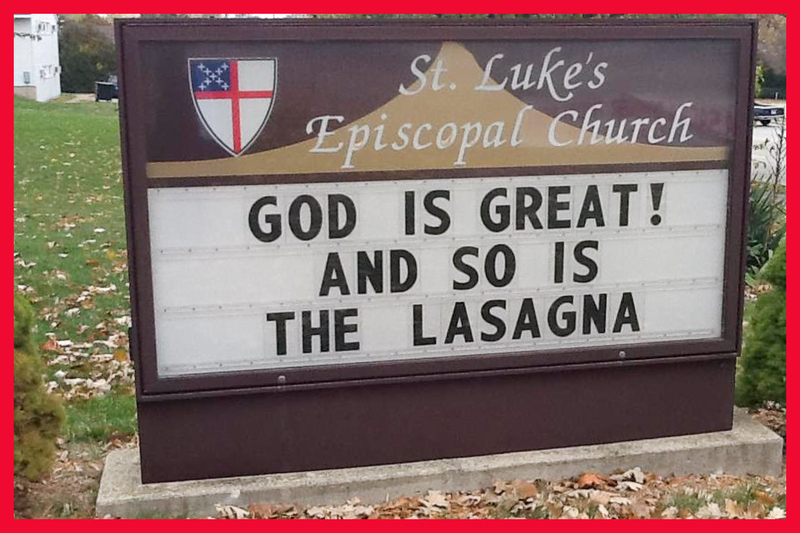 Join Us For St. Luke‘s Famous Lasagna Dinner on Friday, October 20th! All proceeds go to the Northeast Iowa Food Bank so buy yourself a meal and another meal for someone in need. The Lasagna Dinner is on Friday, October 20th from 5:00 to 8:30 p.m. in Will Hall. Adult meals are $10 and children’s meals are $5. Please get tickets at the door or call 277-8520. For any questions or to volunteer, please contact Ernie Doeden. Pilgrims and seekers have been walking labyrinths for over 5000 years. In the ongoing search for life’s meaning, for comfort, for healing, for wisdom, for direction, for communion with the Divine, people have turned to the labyrinth as a spiritual tool, a sacred place to meet God. As we draw near to Holy Week, we invite you to experience this ancient form of contemplative prayer.